After the little boy and I were done grocery shopping, we met hubby at the ground floor of Robinsons Galleria. Asked by his Dad if we like to eat, the little boy was quick to respond, and he was even the one who chose Cajun Red Rock. We ordered Tony’s Favorite Chops and our favorite Creole Chicken Pasta. Tony’s Favorite Chops are grilled pork chops with Jack Daniel’s barbecue sauce topped with roasted garlic. 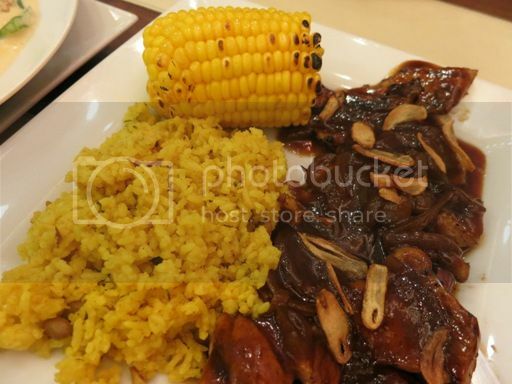 For our side dishes, we chose saffron rice and grilled corn coblets. Everything was okay, except for the pork chops; they were not served hot. We informed our server about this before we left. She apologized for it but assured us that the pork chops were freshly cooked. Cajun’s signature dish, the Creole Chicken Pasta, was simply delicious! 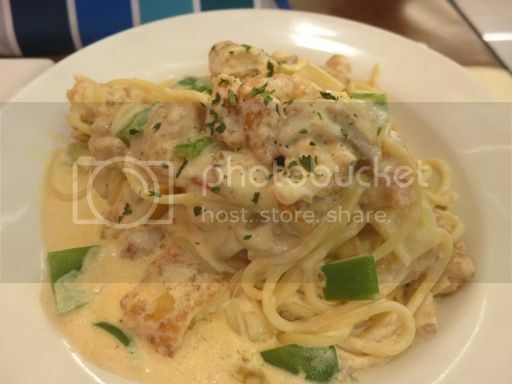 This is spaghetti with special cream sauce and special Creole flavors served with crispy chicken strips. We all liked this very much! This would be a more filling dish, though, if there were more pasta than toppings. We still like Cajun Red Rock despite the cold pork chops, but we’ll order something different from Cajun grill next time. This entry was posted in American Cuisine, Cajun Red Rock, Food Friday, Food Trip Friday. Bookmark the permalink. I had a shot of Jack Daniels, but I still haven’t tasted food cooked with Jack Daniels. Was it good? Did it affect the taste of the food? Haven’t been to Cajun Red Rock yet, but I definitely wanna try those chops! It looks yummy! Sorry about the cold pork chop but the Creole Chicken Pasta look superb!!! Haven’t tried Cajun Red Rock yet but will add it to my list just in case we swingby Galleria. I have to agree with you that the pasta was a bit scanty and overwhelmed by the toppings. I like the alcoholic drink Jack Daniels but never tried food cooked with it hmmm will see if I can visit this Cajun Red rock and try it out. Now I wish we dined there when we went to Megamall yesterday. Di masarap yung nakainan kong resto..haaayyyy. That chicken pasta looks very delicious. I need to remind myself to visit that place when I’m around the area.